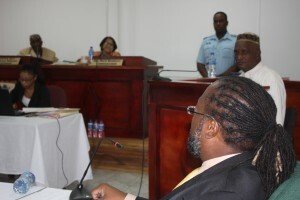 The Chairman of the Commission of Inquiry into the Camp Street Prison riot, James Patterson and the Joint Services Attorney Selwyn Pieters were engaged in a heated exchange on Tuesday morning as the Commission met for a sitting. Patterson raised some concerns about the manner in which video evidence was released to the public and that evidence was not available for the Commission to view. The video evidence in question is footage that was shown to the media corps on Monday. In the video, prisoner, Collis Collison and members of a riot task force were engaged in a scuffle. The video also showed when the doors to the Capital A Dormitory were locked. “It is wrong and you shouldn’t do it…You can’t up and go and not show that to the commission,” said Patterson. While Pieters later accepted the chastisement of the Commission he was in no haste to issue an apology taking a strong stance that he will run his client’s case the way he deems fit outside of the Commission of Inquiry. “It was my expectation that you had the video and I did not know that you didn’t have the video…If you don’t believe me I can resign from this commission,” Pieters loudly proclaimed. To this statement, Patterson sharply responded that Pieters can do as he pleases but as Commission Chairman, he would not be accepting any disrespect.